Providing a regular or flat surface, such as a mousepad. Changing the state of that which passes above it, such as a doormat attracting dirt from shoes. Using rubber mats for flooring and matting provide the benefits of safety, being environmentally friendly, and comfort. 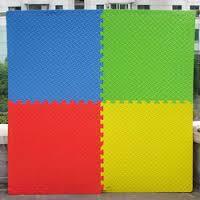 Rubber mats are for outdoor and indoor activities for children. They are synonymous with overall flexibility, resilience and sturdiness.